Some days it’s hard to be an Oregonian. Yesterday became one of those days when an all-white jury in Portland, the whitest major city in the U.S., acquitted the Bundy militia, the group that staged an armed takeover and illegal occupation of a federal wildlife refugee in Burns, Oregon last winter. The Bundy militia became political martyrs of a growing white nationalist paramilitary movement in the U.S. when they were arrested and charged. Now they’re likely to become a beacon of hope to the white right. I don’t doubt this is true. However, while the criticism is apt, I sometimes wonder what people, especially white people, who point out this disparity hope to accomplish by it. Are they telling me this in order to suggest a solution, or are they just signifying that they get “it” on race? This has been on my mind because I fear this kind of comparison feeds a way of thinking about race that puts so much focus on the distinctions between how racial groups are treated that it makes the racial categories themselves seem natural rather than political. And that leads us away from real solutions to racial inequity. I know that idea is probably confusing to a lot of people, but this isn’t just an academic brainteaser. Bear with me and I’ll explain. In order to identify and prove inequity, we need to compare the experiences of different racial groups to one another. This kind of critical comparison is absolutely necessary because racism itself begins with comparisons, with whites constituting a presumed position of superiority against which other groups are found wanting. But when we focus exclusively or too much on these kinds of comparisons, we make it hard to see the how and why of racial categorization. In other words, we stop thinking about why the categories were created in the first place and how racial categorization and hierarchy has been reproduced through so many generations of political change. So, in the interest of clearing up the “why” end of that line of questioning, I’ll state the obvious. Race is a political construct originally conceived of in order to generate profits. Obviously, keeping labor costs down results in more profit, and nothing works to keep labor costs down better than enslavement, especially if enslavement is justified by racism which suggests that the slave is subhuman, making slavery a virtue beyond its service to capitalism. What slavery did to Black people beyond the obvious is that it excluded them from citizenship. Upon this exclusion, the American economy was built. But that’s just history, right? Nope. This practice continues. In the 1960s, the Civil Rights Movement won full citizenship rights for Black people for the first time in U.S. history, at least in theory. But once Blacks were included as full citizens, unemployment in the Black community started to grow. Where in the mid-1960s, Black male participation in the workforce was about the same and even slightly higher than white male workforce participation, today, the Black unemployment rate is twice that of whites. Black women have suffered the greatest increase in unemployment compared to white women because Black women constituted a significant part of the workforce, especially in the South, through the 1960s, a period during which white middle class women often opted to work at home. The rate of unemployment of Black people grew in sync with the inclusion of larger numbers of immigrant workers in the U.S., including a huge number of undocumented immigrants, especially from Mexico, who were driven into the U.S. by international trade and monetary policy friendly to U.S. business but hostile to workers internationally. Today, the industries where low wage Black workers were once over-represented are the same industries that employ large numbers of undocumented immigrants – construction trades, agriculture, food processing, light manufacturing, domestic work, etc. Sure, I get it, the prison industrial complex and racist tough on crime criminal justice policies are the New Jim Crow. But, so is our immigration system. Jim Crow was a legal system that excluded Blacks from full-citizenship. Our immigration system excludes Mexican migrants and other undocumented immigrants. And, as undocumented immigrants have become a dominant part of the low wage workforce, “Mexican” has taken on a racial meaning, as has “Hispanic” and “Latino,” both of which we’ve historically understood not in terms of race but in terms of ethnicity. The popular justification for exclusion from citizenship is racial, not economic nor legal. The economic and legal basis for inclusion should be a matter of self-interest to all workers, if only white American workers could see across race. 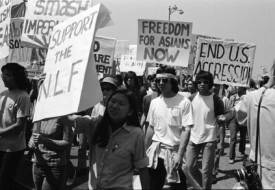 And, just as has always been the case – as it was for Blacks, Asians, and women – exclusion from citizenship is a basis for economic exploitation. 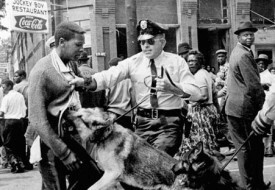 In the context of this history, police brutality and over-incarceration of poor Black people should be understood as a reaction to work force exclusion of low-wage Black workers. What it comes down to is this: U.S. industry basically ripped all of the wealth and labor value out of Black workers. As a result, political elites have deemed poor Black people nothing but a “problem.” The justification for addressing this problem through repressive criminal justice policy and warehousing Black people in prisons may be racial, but racial animus is only one, albeit huge, part of what is driving police repression and killings of apparently innocent Black people. We still live in an economy based on racial classification of labor. In our system, rooted as it is in racial exploitation, Black inclusion in citizenship results in Black unemployment, and an undocumented immigration “crisis” justified by racism produces huge profits for industry. This relationship between undocumented immigrants and Black people suggests very different solutions, including broad based coalition building across the so-called Black-Brown divide, than does comparing the Bundys to, say, the Black Panthers, an argument that if won without challenging state power suggests we would have what, a system that equally represses everyone? Leading with racial distinctions makes building those coalitions more rather than less challenging, both because it encourages ranking oppressions, which is a divisive and useless exercise, and because it leads us to think about race comparatively rather than relationally. A relational analysis of race helps us to see that ending police brutality against Black people is a brown people’s issue, and winning immigration reform is a Black people’s issue. That understanding of race leads in the direction of liberation. The other leads us to focus on interpersonal prejudice in ways that suggest that prejudice is all racial inequity is based on. It’s not. It makes sense given the entanglements of race and exploitation that were present at the beginning of the social construction of race and that have been in place for centuries. I appreciate your efforts…good stuff! !